Labor won back two seats in the Hunter at by-elections in 2014, and then won those other seats listed above plus three out of four Central Coast seats at the 2015 election. They also recovered Port Stephens, which had flipped in 2007. This doesn’t leave much for the Coalition in this region. Out of thirteen seats in the region, ten are held by Labor, along with one for the Nationals, one for the Liberal Party and one held by an independent. I’ve identified six seats worth paying attention to, which I’ll run through below the fold. Let’s start with Upper Hunter, which is the only truly rural electorate in this region. You could argue it could have fit in with inland NSW. It’s also the second most marginal Coalition seat in the state, held by Nationals MP Michael Johnsen by a 2.2% margin. This seat covers Dungog, Gloucester, Muswellbrook, Scone and surrounding areas. It will be a key seat in this election. The electorate was the best seat in NSW for the Shooters party at the 2015 upper house election, but unlike other strong Shooters seats the ALP is not receiving their preferences. Upper Hunter is also one of the only marginal or semi-marginal coalition seats which was not won by Labor during the last Labor government – the Nationals have held the seat continuously since the 1930s. The only other Coalition seat in the region is Terrigal, held by the Liberal Party’s Adam Crouch by a 9% margin. This seat will probably remain in Coalition hands but it could be a stretch goal for Labor if the election goes well. Independent MP Greg Piper has held the seat of Lake Macquarie since 2007. He also served as the directly-elected mayor of Lake Macquarie council from 2004 to 2012. He currently holds the seat by a 10.7% margin. Lake Macquarie had a long history as a Labor seat before Piper’s time. He will probably hold on to his seat, but if Labor is in a stronger position they could potentially gain ground here and make his hold on the seat more tentative. There are also two Labor seats which are held on very slim margins. Labor’s Liesl Tesch won the seat of Gosford at a 2017 by-election following the death of her predecessor Kathy Smith, who had won the seat off the Liberal Party by a slim 0.2% margin in 2015. Labor’s hold on the seat was significantly strengthened at the by-election, with Tesch polling 62.5% after preferences. While we generally use the general election margin to assess a seat’s marginality, it seems unlikely that Tesch will have trouble retaining her seat. The neighbouring seat of The Entrance is held by Labor by another very slim margin. Labor’s David Mehan won the seat in 2015 by a 0.4% margin. Evidence from Gosford suggests he should strengthen his hold on the seat but it’s always dangerous to write off a seat on such a small margin. In 2011, the Liberals had the chance to possibly change politics in Newcastle forever. They won three seats and with those they could have built up a viable organisation that might have even put the federal seats of Newcastle and Shortland in reach. But they got caught up in a stupid donations scandal – obviously the central organisation dropped the ball and let the locals run rogue. Should be an object lesson to any political party and a major opportunity squandered. Both Port Stephens and The Entrance tend to be marginal and liable to swing when whichever major party is “on the nose” with the electorate but whilst they may be worth casting an eye over on election night; I’m skeptical that they’ll change hands this time round and we may see a modest rise in the Lab margin. 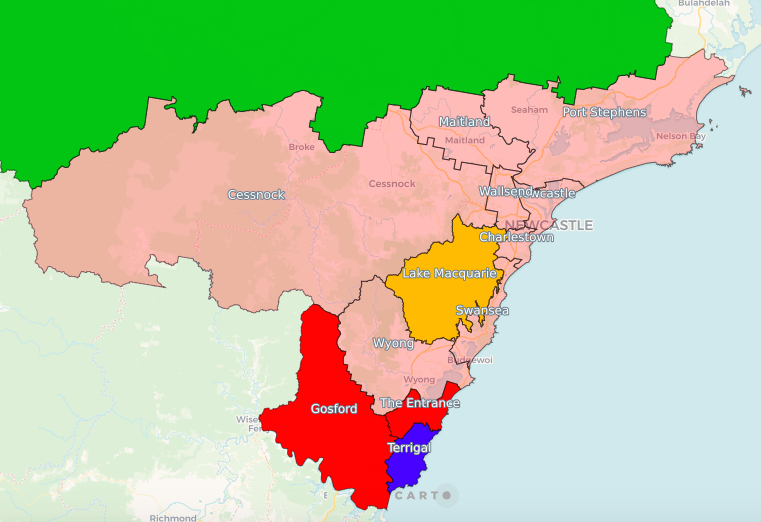 The current boundaries for Gosford look to be Lab friendly and whilst Tesch’s by-election margin is quite large; I’m not seeing any major correction occurring at this time. Piper seems quite well entrenched in Lake Macquarie and whilst Lab will want this seat back; this is another where I’m skeptical we’ll see any change in tenancy. Upper Hunter looks a dogs breakfast to call. The Nats look to be on the nose esp in the northern regional areas of the state; Shooters will have a part to play but will there be a bite-back due to Christchurch and much of this seat is not historically friendly tp Lab. Yes, Terrigal (the eastern side of Brisbane Water) has been rock solid Lib turf for the past 3 decades at least and if this area (previously the Lib part of previous Gosford seat) hasn’t rejected the Libs in landslide elections then its highly unlikely to do so at this one. Upper Hunter is competitive all right; just a mongrel to predict ! !